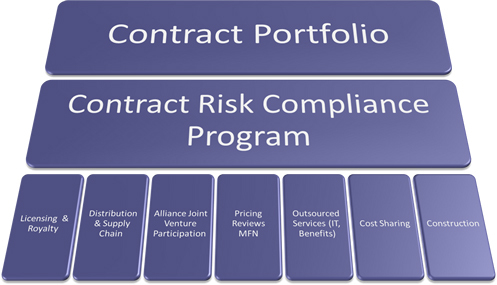 Establishing and implementing a process of regular assessment and monitoring of contractual partnerships is essential to control costs, manage risks, and contribute to the value derived from these arrangements. Risk-based monitoring of these relationships can be very complex and time consuming, often requiring access to subject matter expertise, as well as commitment to regular monitoring of the contractual relationships. Inadequate attention results in process inefficiency, control breakdowns, and incremental costs associated with “patchwork” arrangements. Due to continuing efforts to establish adequate governance structures and maintain transparency, companies realize that these relationships play a critical role to their internal controls and risk framework. SOAProjects provides license compliance, contract management, royalty inspections, channel compliance, fraud investigation, FCPA compliance and litigation support services to a broad spectrum of clients for start-up companies to billion dollar corporations. Every organization has dealings with vendors and service providers. In our experience, nearly all organizations can realize a benefit from Supply Chain Optimization and Vendor Compliance. Some of the areas we can help are vendor rationalization, consolidation and optimization, vendor contract compliance, streamlining supply-chain and vendor management processes, demand planning, logistics and assisting in establishing best practices for more effective cost control. Protecting an organization’s intellectual property (IP) is critical to its success. We help clients deal with the myriad of challenges and complexities of successful intellectual property management. We combine financial, competitive and industry information with our in-depth understanding of intellectual property value to provide litigation support and damages quantification as well as intellectual property valuation, royalty compliance, licensing, and technology and intellectual property management and commercialization. Our experts also assist our clients with resolving a wide range of brand integrity issues through strategic brand protection, counterfeit and IP investigations. From discovery to settlement, we work with clients involved in court cases, arbitration tribunals and administrative hearings to develop the strongest possible litigation strategy. Our experts analyze financial records, develop damages claims, critique opposition expert reports, assist with witness preparation, perform analyses, and provide expert witness testimony. We provide IP litigation, tax planning and technology-transfer expertise that helps improve innovation, manage knowledge and forge superior licensing agreements, enabling clients to maximize the value of their IP assets. Our team is engaged in the entire technology and intellectual asset life cycle, from internal development to external development. Understanding and reconciling what a customer has purchased from you historically, what the customer currently has deployed, and to what extent such deployments are actually being utilized (if relevant), is basic customer intelligence information for sales and compliance teams. Regardless of whether a sale transaction is based on a compliance issue or on an incremental customer need, the sale is enabled by having complete and accurate information. Customer satisfaction is also directly related to the quality of information upon which any discussions are taking place, whether during the sale process or part of the ongoing relationship. In competitive situations as well, having better information about the customer can make all of the difference. For operational reasons including support, information security, business continuity, configuration management, and change management, amongst others. We help business take inventory of their software and hardware assets, and help them develop an ongoing plan to track both Software and Hardware, understand software license consumption, and reconcile it with software license entitlement. 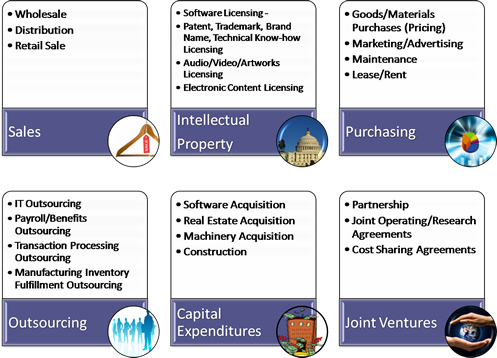 Specifically, software license contracts are becoming more complex, with more clauses and cases addressing specific structures. Ensuring the enterprise is compliant with their software licensing contracts becomes an intricate balance of technical expertise and legal knowledge. Our professionals assist U.S. and multinational clients respond to allegations of non-compliance with the Foreign Corrupt Practices Act (FCPA) and the UK Bribery Act. Our SMEs address a variety of accounting and compliance issues; design compliance programs and controls, identify relevant records and electronic information; and participate in fact-finding interviews and data analytics. We work confidentially with minimum disruption to the business to efficiently gather facts, analyze the issues, and prepare reports and presentations that stand up to regulatory and judicial scrutiny. The complexity of financial systems and globalization of business processes challenge organizations to preserve and analyze transactional data to identify relevant transactions specific to a litigation and to prevent and detect fraud. We deliver strategic business solutions to clients requiring in-depth analysis of large, disparate sets of financial, operational and transactional data. Our professionals map relationships among various systems and geographies, mine for specific transactions, and uncover patterns that may signal fraudulent activity. The firm relies upon a number of analytical software packages to join disparate datasets into a single repository, perform various analyses upon them, and identify trends, patterns and outliers to detect fraud. We also perform audits and IT due diligence, often as part of the M&A process. Independent, third-party due-diligence on complex, low-latency, high-frequency, transactional IT environments has become crucial in today’s data-intensive industries. Compliance with the BSA/ AML – SAR, FBAR, CMIR, CTR, MIL etc. SOAProjects provides audit support for bank collaterals in connection with Asset-Based Lending (ABL). This is any kind of lending secured by an asset. ABL lending is common with businesses and large corporations where assets are used as collateral for loans or when a company needing financing becomes unable to raise capital in the normal marketplace or needs more immediate capital for project financing needs. Typically, these loans are tied to accounts receivable, inventory, machinery and equipment and are referred to as “revolving lines of credit”. It is usually accompanied by higher interest rates as the level of risk for the lender is often greater. Many financial service companies now use an asset-based lending package of structured and leveraged financial services. On August 22, 2012, the SEC issued a final rule on conflict minerals pursuant to Dodd-Frank Section 1502. The rule describes the assessment and reporting requirements for issuers whose products contain conflict minerals. These minerals – tin, tantalum, tungsten, gold and derivatives of 3TG – are used in a wide range of products across numerous industries and technologic applications. This newly enacted 2013 regulation establishes the requirements to facilitate tracing of prescription drug products through the pharmaceutical supply distribution chain to insure the safety and security against counterfeit drug supplies. It establishes processes to detail all prior information in the chain in the event of recall events and imposes strict requirements on manufacturers, wholesale distributor, dispenser or re-packager to implement systems safeguarding the sources that are authorized and have processes in place to investigate suspicious products. SOAProjects extensive experience in Supply Chain Advisory Services uniquely provides our clients with the ability to assess compliance with the new regulations to “Track and Trace” and to thoroughly investigate any suspicious sourcing indicators. With the advent of the Affordable Care Act the traditional healthcare landscape has changed. Businesses continue to experience challenges in implementation and interpretation and there are major impacts felt throughout the industry. Employer groups, 3rd party payers, and healthcare providers can all benefit from the subject matter experts at SOAProjects. 2014 Businesswoman of the year. Top women owned Business 2011. CEO of Bay Area 2012 Best Places to Work . Appreciation from Industry Council for Small Business Development . Outstanding and Dedicated Service Award from IMA Peninsula Chapter's Controller Forum 2012. March 2017 - SOAProjects is pleased to announce that Miguel Martin has been promoted to Partner, leading the IT Compliance and Advisory group. December 2016 - 5 years as Alchemy Partners Team joined SOAProjects! Their integration with SOAProject has been beneficial for both sides. Happy Anniversary Alchemy Partners! © Copyright SOAProjects, Inc. All Rights Reserved. We are not required to register with the Board of Accountancy for the services provided. Safe Harbor Policy.